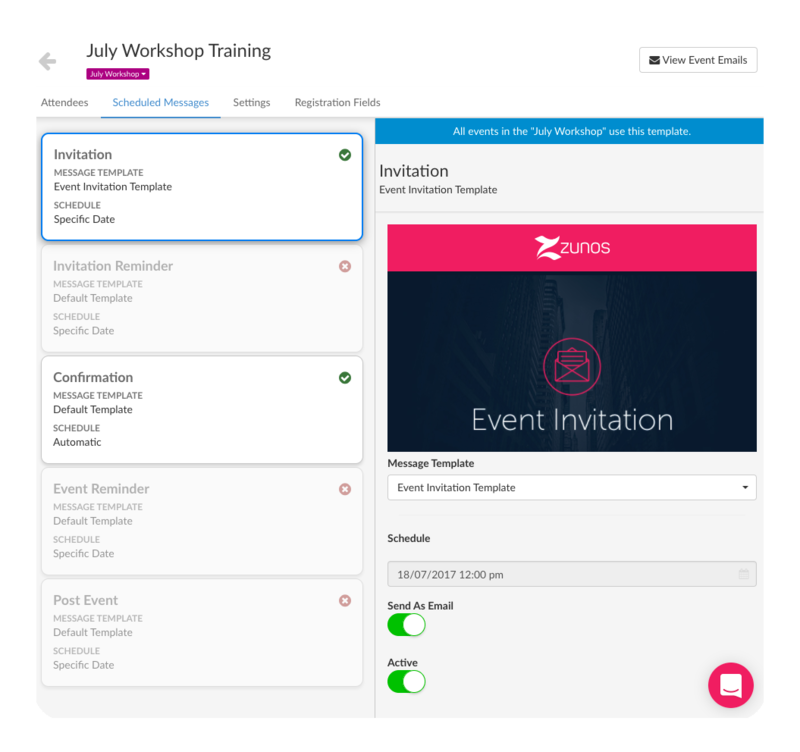 Whether you're running a small workshop or large scale event, manage the process with Events in Zunos. You can create events, manage attendees, schedule event communications, mark attendance and more. Read below to find out how to create an event or if you prefer, watch our 5 minute instructional video on how to create an event. In the Zunos Admin portal, go to Events module. Click Create in the top-left hand corner and Create Event. Enter the Name of the event with a brief Description describing the event. Assign event a Start Date and End Date. Select a Set from the list or just simply leave this field blank and click Save. Tip: Adding a number of events to a set, will restrict users to register for only ONE event in the set. Ideally, similar events happening at different times can be added to a set to enforce this rule. To add your event to set you can simply do so by clicking below the name of the event. Here, you either select a set from the list or create a new one. If you're only running one event you won't need to create or add it to a set. Note: Events Sets have replaced the previous 'event session' functionality in an Events. Geofencing Location: Event information appears on a users device when they are approaching the location. Slots: If assigned an integer value then the event will allow any number of users unless specified. If left blank, slots are unlimited. Registration Start Date: Registration will commence at the listed date and time. If this section is left empty, event registration will commence when it is set to active. Registration End Date: Registration will close at the listed date and time. By default, it will close at the time the event is set to commence unless a time had been specified. Time Zone: By default, it will be the same as your organisation time zone. Contact Email: By default, the point of contact will be the event sender. In the instance where your participants cannot attend a session or would like to make an enquiry with the event organiser, they can reply to the invite and contact yourself or one of the event admins at this email. This email address will also appear under the [CustomSupportEmail] merge tag in a message template. Registration fields allow you to add fields in the registration form when an attendee registers for your event. You can collect anything from dietary requirements to job titles and any other information you require from your attendees to make your event a success. Attendees allow you to either add users to the event from an existing group or smart group or create your own smart group. To add attendees choose an existing group/s or smart group/s or create a new smart group by adding in your own criteria. Your attendees will appear in the list. The status bar shows when a user has received an invite, registered for an event or attended the event. If an attendee declines an event by accident you can un-decline them, simply select the attendee from the list and click on un-decline selected attendee button on top of the list. You can also send event messages out manually from here by bulk selecting the attendee list and clicking Send Emails from the tool bar. This section allows you to set your event message templates for the event and also schedule when they are to be sent. You must add your message templates first, before adding them here. 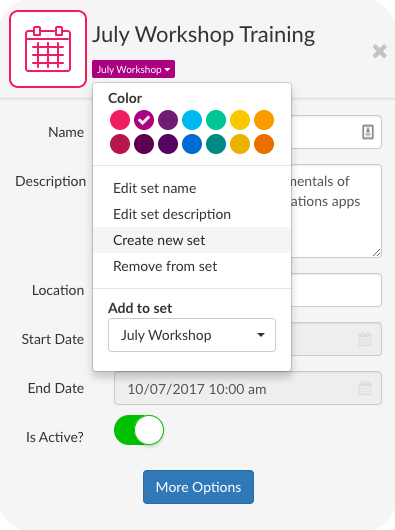 If you're creating a number events in a set, wait until you have added all of the event settings, attendee, registration and message details. Now you can go back to your events list and duplicate the event by selecting it and clicking the Copy event in the top panel. Create as many events as you need and then update the details. For example, add different event start and end dates in the event details pane. Finally, ensure your event or number of events in the set is/are active.